Wall calendars are the most effective marketing tool for customer retention in Kamloops. Does your business in Kamloops print calendars for the customers? If not, then you are missing out, because printed calendars will ensure repeating business from your Kamloops customers. Make sure to put the logo and contact information of your Kamloops company on the wall calendars to achieve better results. Get even higher results by putting monthly specials and promotion on each month page, so that your Kamloops customer feels special. 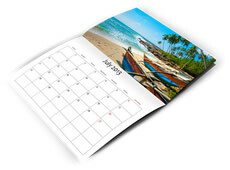 Our clients in Kamloops can order as little as 10 calendars per order and up to 5000 and more. All wall calendars come with a pre-drilled hole for a convenience to hang them on the wall. Don’t have time to design your Kamloops wall calendar or just simply not sure how – let us do it for you. Our professional and creative design team will do all possible to make sure that your wall calendars for your Kamloops business look attractive and informative. If you have any questions about wall calendars, available options and turnaround times or would like to get an estimate for your company in Kamloops, please don’t hesitate to contact us. We are always happy to assist you and answer all your questions via phone, email or in person.